This Outback-themed bone china Mug features images of the outback’s most well-known icons and scenery, including Uluru (of course! ), dingoes, a drover, a long stretch of red road, and more. 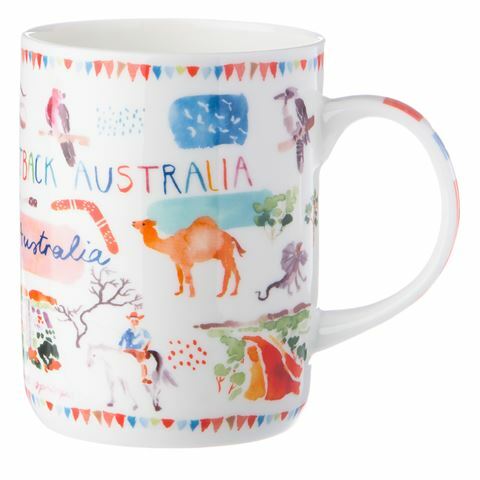 Australia Down Under mugs will colourfully remind you of why our country is so amazing, every time you sip your coffee... a quirky way to show off your patriotism for sure! Features vibrant and colourful images of the outback’s most well-known icons and scenery, including Kakadu National Park, dingoes, indigenous artefacts, a drover, and more. Back of gift box has a blurb outlining the history of the outback region. Dimensions: 10.5cm (l) x 8cm (w).